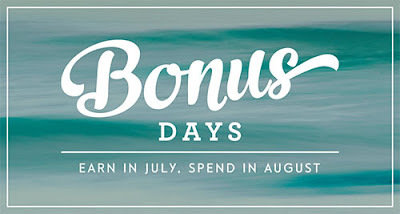 Bonus Days are here! | Midnight Crafting Midnight Crafting: Bonus Days are here! Did you get everything you want from the new annual catalog yet? Since it came out only a month ago, you probably still have some items on your wish list, and we have some great news for you! that you can use August 2-31. This is a great opportunity to shop from your wish list, whether you buy your favorite products now or later in August with your coupons! 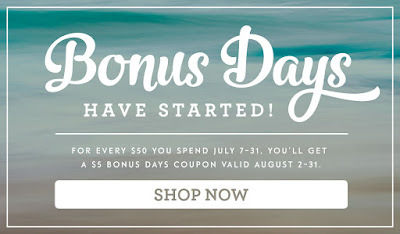 There is NO LIMIT to the Bonus Days coupons you can accumulate - these will stack up for your shopping pleasure in August! 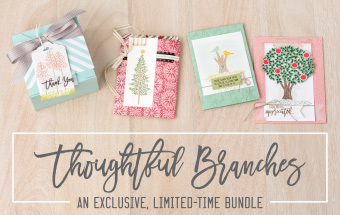 AND you can use them on the special limited edition bundle Thoughtful Branches! SO Pretty - only available this August!